Is this not a beautiful dessert? This is my own creation and it is as yummy as it is pretty! The berries have been absolutely delicious this year. The blueberries are big and juicy and the strawberries...what can I say! Last year I made this for the first time and did it a little differently. But this year's variation was the clear winner for taste. 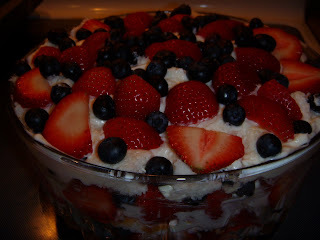 It has moved into the "must haves" on our 4th of July party menu. You are going to have to divide everything into thirds. Layer the cake, cream cheese, berries, repeat. I like to save back some of the strawberries for the top and instead of slices I cut them in half. You can get as creative as you want on the top. To make sure the berries are easily seen be sure to slide some blueberries and strawberries down the sides of the bowl as you layer. Such a wonderful dessert. Light, refreshing, and full of flavor. Enjoy!! !